One of the most pernicious examples of collusion with the fascist-elite against the voting public, is the fact that major news networks regularly employ talking heads who are simultaneously card-carrying members of a conspiracy elite cabal - either the Council on Foreign Relations (CFR), the Trilateral Commission, the Bohemian Club, or the Bilderberg Group. "...that some secret forces are planning..." Ya, like the CFR! Of which Ron Paul, and the guy who asked the question, mentioned specifically. Toobin's vitriol is directed at Paul for the simple fact that the CFR is named as the lynchpin of the North American Union. 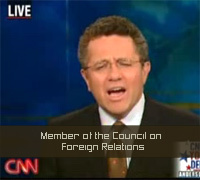 Toobin is enamored with the power and prestige associated with his beloved Council on Foreign Relations. Being such a fresh recruit, defending the organization is the least he can do - and is most likely required. That's a pretty straightforward answer, even courageous when you take into account the reality that most people alloted airtime on the mainstream media are invariably sellouts to the elite (Toobin, being a perfect example). The deck is stacked, and has been for quite some time now. Since the birth of the CFR in 1921, its members have variously been elected to high government office (executive branch included) and have traditionally had control over the state department in every administration; not to mention the induction and corruption of America's most prominent journalists, editors, business moguls and Ivy League educators. On what Ron Paul has said (and a rebuttal to the MSM's denial), please see the latest primer by Steve Watson: "Dear Deluded Mass Media, North American Union Agenda Exists." There's also good material by the Council of Canadians, in a section of their site called "Integrate This! ", as well as John W. Foster's "The North American Competitiveness Council: A corporate coup d'etat." Lastly, the North American Forum had its third annual secret conference in Mexico recently - whose entire existence would still be unknown if it weren't for a few determined souls. As I reported in September last year, the CFR's "Building a North American Community" was the "final recommendation before the Independent Task Force on North America disbanded in September, 2005." The document explicitly recommended the creation of "private bodies that would meet regularly or annually to buttress North American relationships, along the lines of the Bilderberg or Wehrkunde conferences." And wouldn't you know it, just a month later, the North American Forum convened in secret and included 12 members of the original CFR task force. In essence, the CFR - after recommending an agenda and then anointing themselves for that very task - became the sole arbiters of the secret negotiations to implement "a North American economic and security community by 2010." If you live in North America, it is high time you become familiar with those who have your future in their hands. They met again this year, in secrecy as usual. And just like the Bilderberg group - to get a handle on what it is they're up to - insiders and whistleblowers are the only means of effecting even the smallest amount of accountability.